Adam and I accomplished something that was (in our minds) pretty awesome. We made two complete meals using only Indiana raised/grown main ingredients. When I say “main ingredients,” I mean that our butter and sour cream didn’t come from Indiana, but the meat and veggies did. This worked out to be both an amazing dinner and breakfast! Both our cow (Betsy) and piggy (Pete) came from Seven Sons farm in Northern Indiana and our vegetables came from Farmer Amos in Western Indiana. 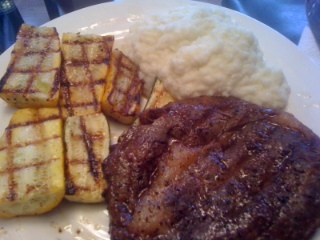 Dinner consisted of Delmonico (ribeye) steaks, mashed kohlrabi, and grilled yellow squash and zucchini. You may be wondering … what in the world is kohlrabi? Well, I know I was before this week (even kind of as I was preparing it). I wish I would have taken a picture of it, but I’m sure we’ll get another one in the upcoming weeks that I’ll be able to. Honestly, it was like a potato except the skin reminded me of an artichoke and the “leafy” part looked like chives or the tops of green onions. It’s a weird looking little bugger, but quite delicious! 🙂 Now for the preparation methods! Let the steaks sit out for approximately an hour to an hour and a half in order to bring them to room temperature. Pat dry with a paper towel. Rub the steaks with as much (or as little) salt and freshly ground pepper as you would like. Grill them approximately 3 minutes per side and then put them on the top rack (lower heat) for approximately 5 minutes. Then, once brought inside, lay foil over them until they are served. This preparation will get the steaks to medium rare. Anyway, once it was peeled, I cut the kohlrabi (which at this point looks/feels exactly like a potato) into 1 inch cubes and boiled them for about 30 minutes until I could easily get a fork through all of the pieces. Then, drain the water and add the other ingredients. I used an immersion blender to mash the kohlrabi mix the ingredients together, but a food processor or blender would work just as well I’m sure. Honestly, this tasted pretty similar to mashed cauliflower. But, it was pretty delicious, and I definitely plan on making this again! Cut the squash and zucchini length wise, then in half, and then length wise again. Melt the butter in a large glass bowl, and coat the veggies. Then, add the garlic powder, salt, and pepper and coat the veggies in them. Grill the veggies for approximately 20 minutes, turning once to get the cool grill lines (thanks for that, Adam!). Now for breakfast! What we were really trying to do was to duplicate the amazing breakfast we had while in San Francisco at Bocadillos. 🙂 It worked fairly well! Which was awesome. 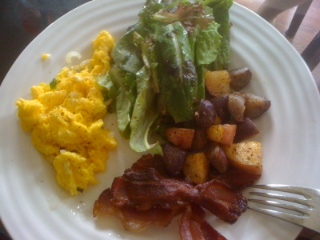 We had scrambled eggs with green onions and cheese, bacon, new & purple potatoes pan fried in bacon fat, and mixed greens, yum! I think the eggs and bacon speak for themselves, but I’ll help you out with the potatoes and mixed greens. I will admit that I was a little freaked out at first by the purple potatoes. I thought they were just bad or something, NOT the case. They are delicious! 🙂 Adam cut them into 1/2 – 3/4 inch cubes and pan fried them in bacon fat, adding only freshly ground pepper, cayenne pepper (because he knows I love the heat!! ), and chili powder.